Penang er en by som er like rik på historie som det er i kultur, tradisjon og mangfold. Denne byturen fremhever alle de beste, fra kolonitidenes hjem, til private herskapshus, berømte museer og fantastiske templer. Følg en ekspert lokalguide gjennom den berømte Little India og Chinatown, vandre hallene på Penang Museum og lære om kunsten til tinnsmedarbeid på Royal Selangor. Avslutt turen på Wat Chayamankalaram, hvor du vil bli overrasket av den gigantiske tilbakestående Buddha. 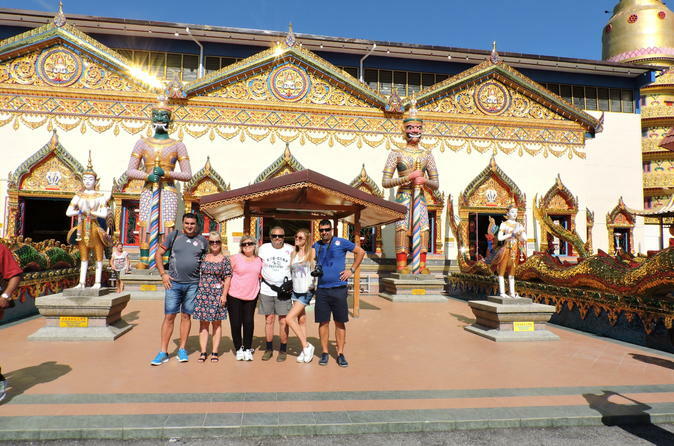 Bli med din ekspertguide og en liten gruppe medreisende på denne Penang City Bus & Minivan Tour. Reis gjennom koloniale Georgetown, hvor du betaler et stopp til den berømte Fort Cornwallis. Hør som din guide deler innsikt og historier om mest kjente historiske gjenstander i byen. Deretter gjør du veien til det fargerike Little India og eklektisk Chinatown før du besøker Royal Selangor, hvor du vil se lokale håndverkere som moteverk fra tinn. Etter å ha beundret denne eldgamle kunsten, gå til Wat Chayamankalaram, hvor du finner verdens største tilbakestående Buddha-en av turens mest minneverdige severdigheter! Din siste stopp er Penang State Museum, hvor guiden din tar deg gjennom haller i denne kolonial-ørebygningen og peker på gjenstander fra Malaysia, Kina og Indias unike fortid. Velg å gå tilbake til hotellet, eller nyt shopping på fritiden din på Gurney Plaza. As another recent reviewer has said, mine also ended up being a private tour because no-one else had booked for that morning. I wouldn't have chosen a private tour, but actually it was very enjoyable. I also had Philip as my guide. He was great. We paid for extra 4 hours tour to cover more sites on the island. Our guide/driver spoke excellent English and was very eager to please us.However,it felt uncomfortable when he almost forcefully took us the shops where he expected us to buy thingsit was clear that he has a personal deal with those places.Still, that was the best way to tour Penang when your time is limited. The tour was excellent organize and the guide was perfect. I have only one remark. During the booking my feeling was that I correspond with AI which need more learning. I repeatedly received repetitive messages that were unrelated to the issues of refinement. It is good for no FAQ questions to have more human control. and great commentary from my guide John. Thank you. We were picked up late from our hotel, not a problem, a communication break down somewhere, however Philip our driver was so enthusiastic and apologetic about the delay he more than made up for it in our half day tour of Penang. We covered a lot of the tourist attractions, along with a wonderful, knowledgeable and detailed history of the area and sights. We had a great morning, a few laughs and now know a lot more about the wonderful history of Penang. Well done Philip. Everything went like clockwork, right from the booking and confirmation stage, and then the actual trip was very good. We were so fortunate as there were only two of us in a car, so were able to stop when we wished and see things that otherwise we may have missed. The guide was very knowledgeable, knew his history very well, was easy to understand and had great empathy. Our only issue was the pre Christmas traffic. Absolute chaos. The poor guide had to manage this by changing the route and showing us some sights that were not on the itinerary. We were very happy with that and the traffic did not deter us from completing the trip. Well done to our fantastic guide. We did try to book him again, but as a cruise ship was in port were unable to get further bookings. A disappointing tour with a poor guide. The tour did not give us the expected introduction to the key sights and heritage of Georgetown. This tour was excellent. Lawrence our guide was friendly and very knowledgeable. Would recommend him any day and trip was great.